Christmas Gift Guide #2 – For HIM! Hello everyone! This gift guide is for men, and these are presents you could buy for your Boyfriend, Brother, Dad, Uncle, anyone male! 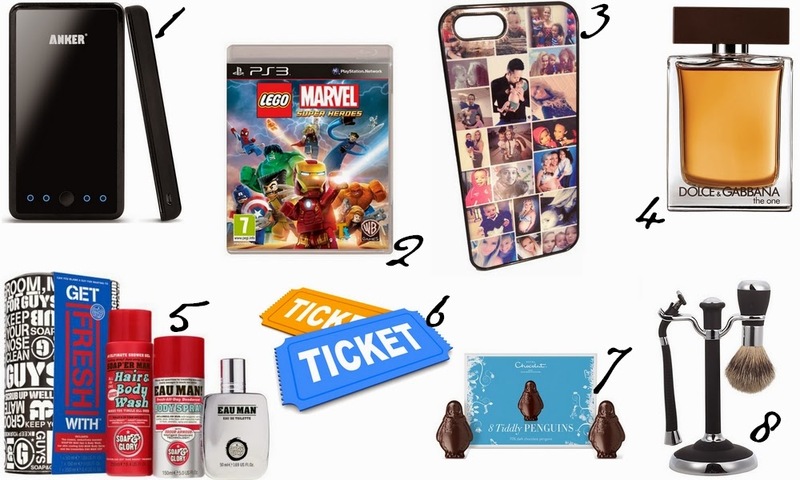 I’ve based this gift guide on my boyfriend. Anyone would be grateful for one of these badboys! Everyone and their dog owns a phone nowadays and the amount of times I hear people saying their phone has low battery while they’re out, well this is perfect for them. This particular charger can charge the majority of portable devices, and in one charge, can charge an iPhone 4-5 times, a Samsung Galaxy S3 three times and an iPad once. This is such a popular game at the moment, from children to adults! Everyone who loves Marvel or Lego will love having a go on this game. I’ve already pre-ordered my copy for the PS4! This game is available on PS3, PS4, PS Vita, Nintendo 3DS, Xbox 360 and Xbox One. This is a lovely gift, and on Photobox you can personalise cases for the Samsung Galaxy S2, 3 and 4; iPhone 3GS, 4/4S and 5/5S; iPad and iPad Mini; and also iPad covers. I would love to give out these for Christmas, you can either have one photo or a collage. The best part is picking their favourite photos to go on the case! Aftershave seems to be under the tree nearly every year for most men, just as perfume is for us girls. I LOVE the smell of this aftershave, and my boyfriend owns it so I can accurately review how good it smells haha! So if you’re unsure what to pick for a gift for a male in your life, you know that this smells good! This includes Soap’er Man Hair and Body Wash, Eau Man! Body Spray and Eau Man! Eau De Toilette. Do I have to say much, as this is a Soap and Glory Gift Set. That says it all really! But I will say, this would make a nice change to the Lynx Gift Set every man gets every year! I think getting tickets to a concert or a comedy show is such a good gift, especially if you go together and have a fun night! Some aren’t that expensive, especially comedy shows, and they don’t sell out very quickly! Now most men are seen as manly, however, who doesn’t love penguins?! These are the cutest things ever and would be appreciated greatly by your Boyfriend, Dad or Brother. This includes a stand, with a matching razor and shaving brush. I think this is a nice traditional present and keeps those moustaches and beards trim and tidy!